Stay and hide. Run and fight. Either way you risk it all. 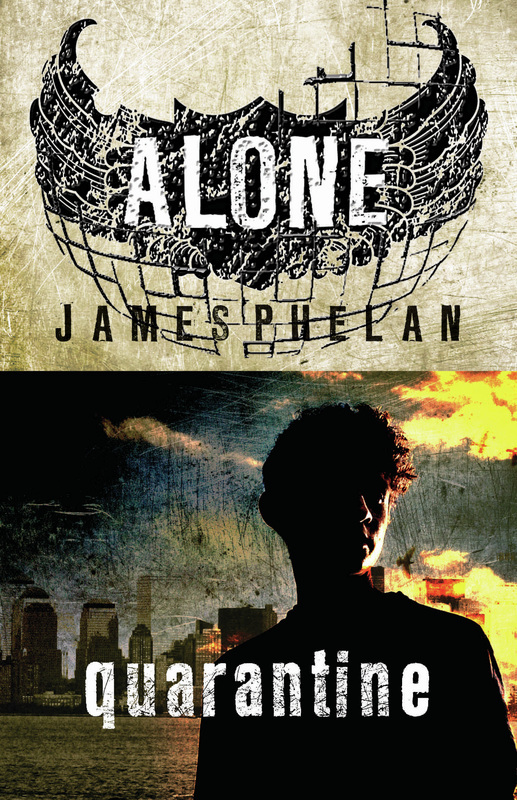 In the scant few weeks since an explosion decimated New York City, sixteen-year-old Jesse has lived through the unimaginable. Only two types of people are left: Chasers, infected with a virus that turns them into bloodthirsty killing machines. . .and those they hunt. Jesse isn’t waiting to be a victim. There’s a collective of survivors in the city. Once he’s located them, they can find some way out of Manhattan and Jesse can get help for those he’s guiltily leaving behind. But first, there are the obstacles. Crazed Chasers. Dangerous power struggles. And so-called allies hiding the terrifying truth. . .
Quarantine is book 3 on the ALONe young Adult trilogy. We buried the snow leopard in the morning. The three of us stood in the mist that came with the winter’s dawn, the empty streets of Manhattan as quiet as they’d ever been since the attack. The lonely grey light sucked the colour from everything but it was all we had to work by as we dug into the earth. A dark stain of frozen soil covered the animal’s mate, who we’d buried just the day before, two lifeless forms in stark contrast to a blanket of fresh white snow. It was Felicity who insisted on the funeral, not Rachel, the animal’s carer. Maybe it was Felicity’s way to keep me here a bit longer, in the hope I’d change my mind about going; or in the hope that while I stalled here a miracle would come – rescue by whoever was left. Not that we knew who was left, not for certain. That’s why I needed to leave the safety of these fortified zoo grounds, yet again. Exploring the unknown was our best chance for survival. In the snow-leopard enclosure of Central Park Zoo we held a little ceremony of sorts, silent and stoic. Felicity didn’t cry but Rachel did – just falling tears, no sound of sobbing. My two fellow survivors, standing next to me, remembering these beautiful animals that had never done anybody any harm, killed by violent figures in the night, those with an unquenchable bloodlust. There was a bang-crash of a building coming down, probably nearby on Fifth Avenue. ‘That was close,’ Felicity said, spooked. I nodded, words obliterated, for the sound had roused all the animals left in the zoo, waking them from their mournful chorus into a symphony of alarm, as if they knew that their tickets out of this life were loosely hanging chads. So far this morning the Chasers had stayed away, as if out of respect for the properly dead. I was kidding myself by thinking that – they didn’t need emotions, just as they didn’t need normal food or shelter or warmth. At least, that was true of the predatory Chasers, the infected who would hunt you down, the ones who’d survive. Ironically, those whose contagion was wearing off – who were technically getting better, their faculties returning – were worse off. By the time they improved enough to find food and shelter, it would be too late; if the agressive Chasers didn’t pick them off, one by one, the harsh winter would. If my friend Caleb was one of the weaker kind, I could search him out, look after him. But he was a bloodthirsty Chaser, and there was no reasoning with them, as I knew from experience. The only resolution to a conflict with them was death. Was there any hope for Caleb? Probably not. Could I give up on him? No. My packed bag was on the ground. I’d been ready to bug out of the zoo when the leopard died, but now I had doubts. I felt guilty about wanting to leave. I’d tried my best to calm and soothe Rachel. She’d said harsh words, what I felt might be final words . . . and then all our conviction, on both sides of the debate, came undone with the sudden ceasing of a heartbeat. How callous that sounds, but that’s what it had come to: the death of an animal and what came with that had kept me here. Before what, exactly? Maybe the uncertainty was the worst part. About twenty per cent of New York’s cityscape had been destroyed in the initial attack. But every day since then there had been new fires and explosions, buildings falling one by one, here and there, as if to remind us that there was more to come. There was another act – maybe several more – to be played out. They weren’t finished with us yet – whoever they were. ‘You should sleep,’ Rachel said, jolting me out of my thoughts. Neither of us had slept in the night and we both had full days ahead. ‘So should you,’ I replied. ‘I’m not the one going out there,’ she said. ‘I can’t,’ I said. ‘There’s no way I can sleep right now.’ She wiped the back of her sleeve down her face, her breath fogging in the cold. We watched Felicity trudging towards the main building, heading off to rest. Or maybe she was giving me and Rachel time alone. I got the feeling that Rachel had something she wanted to say to me. ‘Yeah?’ I said, crossing my arms around my chest. I’d tried to do the right thing. I’d spent so long denying the reality of events myself I could recognise the same behaviour in Caleb. You need to feel it, I told him, remembering that I’d forced him to visit his parents’ place. He hadn’t been able to express the horrors of what he’d found but it was pretty clear he’d seen more than he needed to. It had reminded him just how much he’d lost – he lost everything; he’d lost it all. Her words hung in the air for a moment and my breath steamed in front of my face as I studied the newly disturbed dark earth and deep snow in front of us. ‘It was beyond your control,’ she said. I nodded; I wanted to believe. She stood close to me, her body warm against mine. ‘Thanks,’ I said. I was glad that she saw it that way. I stood and she hugged me and we walked out towards the central pool. I paused by the gates to the zoo, and adjusted the straps of my backpack. The weight of the loaded pistol in my coat pocket no longer gave me peace of mind or felt like a burden; it was just there, another appendage in this new world. She looked from the caged animals to me. I could see Felicity standing at the bedroom window, upstairs in the zoo’s big old brick building, watching us down here. I headed out alone. Me and these streets. Eighteen days since the attack, eighteen days of avoiding death at the hands of the infected. I walked through the park. Rocks shifted in rubble underfoot and rats scurried from a dead body. How I hated this place. Today had started out freezing and damp, and now a wall of wet snowdrift blew hard against me in a headwind. I headed south-east, under the heavy, grey February sky, with the wind blowing around me and frozen rain falling. I’d learned to feel this weather now. When heavy snow rolls in, darkness comes early, time gets lost. In the streets it was easy to be lulled into a false sense of security, deaf and blind to what might lurk in the silence and shadows. How would this day end? Would it be any different from the others? To catch my breath, I took shelter in an alcove, not that different from one in which I’d sheltered from similar weather, with a girl. We’d kissed. Anna. My first kiss, right here in this city, from a girl I would never see again, sharing an act full of heat and stomach-turning butterflies I might never know again. She’d tasted of strawberries. I smiled at that memory, licked my cracked lips. I could almost taste it. Like so many, Anna never got to go home. She was one of the first to be taken in this attack. At least it was quick. I had no idea if she was religious or not, but I hoped there was someplace for her to go, someplace warm and sunny . . . The best I could offer was to remember her and others when I got home to Australia. When I got back. It seemed an impossible distance to travel. The sun peeked out from behind the heavy winter clouds and illuminated the road that stretched out before me. Near the Hudson River I turned south, following streets I’d not walked before near the western edge of Manhattan. I liked the new sights here – desolate, sure, but this was an exploration of the unknown I felt I could handle. It was as if there was someone contriving to send me there, calling me onwards to the south. After two blocks of weaving through smashed cars and downed buildings the road became impassable. Even so, this morning I felt driven. I trekked these streets with purpose. This wasn’t some false hope, some blind excursion: I was looking for a group of survivors, even though the only evidence of their existence was what Caleb had told me. If the group he’d told me about was still at Chelsea Piers, then I was relying on my ability to persuade them to leave. I hoped. I’d seen more of human nature in these past two weeks than I had in all my sixteen years; the best of it, and the worst. Was I crazy to expect anything of anyone, that as survivors we shared a common goal? It was my job to convince them, right? I’d persuade them it was safer to leave the city, that we had to get out. I’d take them via the zoo to get Rachel and Felicity and we could head north. Then I saw something new. At the crossroads before me were three bodies, slumped on the packed snow, but not covered by it. They were fresh: there were traces of colour in their cheeks and the blood on their flesh was thin and red, not black and congealed. Anyone could have seen they were not Chasers, and I didn’t think they were the Chasers’ victims – the work was too clean. I’d known there must have been people who’d survived the attack. I just hadn’t seen them. In true New Yorker fashion, perhaps they’d taken the advice given after 9/11 and barricaded themselves inside. Doors sealed up, windows shuttered, cupboards stocked with all kinds of long-life food. Shelter in place. That was my theory, anyway. But could anyone live that way for long? Maybe here was the answer. These people had had enough: they’d had to break free, to escape, to look for people like me, a way out. Only they hadn’t made it. Had anyone noticed they were missing – and would they be missed now that they were . . . gone? I tried not to think of this unknown. In fact, I sped up, as if there were people expecting me, waiting anxiously for my safe arrival. No. My fears were real. I hid in an overturned school bus. Both the front windscreen and rear window were in place but there was a black jagged hole of torn steel where the door had been. Dark, deep snow banked up against the side windows, which were almost at ground level. There was a tear across the palm of my glove, and I knew I’d cut my hand badly – hands that had already taken such a battering. I couldn’t see the wound but through my clenched fist I felt the warm, sticky blood. I was scared to breathe, my every motion loud and amplified in here. Through the grimy windscreen I watched their feet shuffle as they passed. The wind, blowing hard from the south, might keep the horizon’s heavy storm away – maybe it would even skip Manhattan altogether. When it looked safe, I dropped down from the bus to the road and tore up a spare T-shirt to use as a bandage. I should have packed a medical kit. I tightened the straps of my backpack and continued south. At the next intersection the breeze whipped past the corner building and carried with it smoke, the smell of burning petrol and plastics. I covered my nose and mouth with the front of my jumper, and ran across the intersection and down the next two blocks, before I cracked and took in heaving lungfuls of air. It tasted cold and sharp and clear, dizzying. Gotta keep moving. Gotta get there, get off these streets. The unknown was getting to me. The familiar parts of Midtown in which I felt so safe now seemed so distant. Sure, I was headed towards something that stirred hope in my gut, but getting there . . .
At each intersection I stopped to check that the coast was clear before crossing the open terrain. I always stayed a few paces away from the dark facades of the storefronts, in case a Chaser jumped out and surprised me. I made sure my footing was on firm ground. Gunfire crackled from the east. A few single shots, then a continuous burst of machine-gun fire. I recognised it immediately, even though before I arrived in New York I wouldn’t have known the difference between the sound of an assault rifle and a pistol. I had never held a weapon, couldn’t imagine depending on one for my basic protection. But now the need to survive had made me an expert. An image of last night flashed in my mind’s eye: the soldiers at their truck, shooting at the Chasers, the aircraft coming in on an attack run . . . The gunfire petered out and with it my awareness of the present returned. Keep moving. I headed west at 56th. I knew I hadn’t travelled along here before, but it reminded me of so many other streets: the widespread destruction had rendered mismatched city streets uniformly grey and cold and frozen. Manhattan was one big canvas of repeating patterns. I passed a postal van: which reminded of when I met Caleb. I checked inside it – nothing, no living thing. Nothing but windswept snowdrift and ash. At the next intersection, my back to a wall, I watched for movement reflected in a cracked pane of a shop window. It seemed clear but then something shifted in the shadows across the street. People? More survivors, trying to make sense of what made no sense at all? How would they react on seeing me? What if I didn’t have the answers they wanted to hear? I could see them more clearly now. They were Chasers, but I could tell that they were only very recently turned, and had not yet had to fight, to kill. They were dressed in their warmest, best clothes. These were people who were used to taking care of themselves, who had never had to be content with making do. But that didn’t stop them looking wild. Angry. I smiled, tentatively, for a moment, as they emerged from the shadows. I’ve outrun you before . . . As I feared, they were anything but pleased to see me. These were the chasing kind; demented, driven crazy by isolation and captivity. Flat out, I ran down Seventh Avenue, the six of them after me. Seemed the chase was new to them; they strove to use muscles that had been inactive for over two weeks. The effort and pain intensified their rage. Their hunger drove them on, relentless. My feet skidded out as I turned onto 44th Street, falling as I slid on the ice and tripped over a street sign that was bent across the sidewalk and concealed by snow. Run! Got up and ran. Stopped at Ninth Avenue, looked back – they were gaining! South – keep moving south. I ran as fast as I could, my arms and legs pumping, my feet slipping and sliding over uneven ground and ice. At the end of this block I turned left, looked back – couldn’t see them yet . . .
Then they appeared. Maybe it was the distance or my imagination, but they didn’t look exhausted: they just kept coming for me. I backed away, my feet heavy lumps of concrete. Turned and ran. At the next corner, at Tenth Avenue, there was a tall building about fifty storeys high, an ugly seventies thing that stuck out in this neighbourhood. I headed for it. The awning said ‘West Bank’ and something about a theatre. I passed a cafe, doubled back, ran inside. I stayed low, tried to snib the door but there was only a keyed lock – I backed into the cafe, stopped dead still. There was someone behind me. A presence . . .
A cough. Deep, like it belonged to a big man. I didn’t want to turn around – If this is how I am going to go, let it be quick.